The section "Increasing thickness & checking from the side" says black 1 is normally answered with white 3, but there is no diagram or further analysis on this position. Is this really, the main line? If so, would a little more discussion be useful? might look slow but it is big territorially and it has a big effect on future developments on the left side. 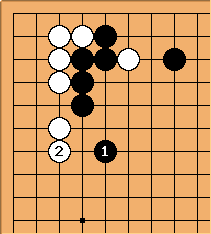 As shown on the main page, if White plays tenuki instead of , Black can seal off the left side by attaching at the point. White might omit if Black cannot get enough from the left side to make up for White's play elsewhere. Also, White gets sente after the Black attachment. So it is a complicated situation involving whole-board consideration.